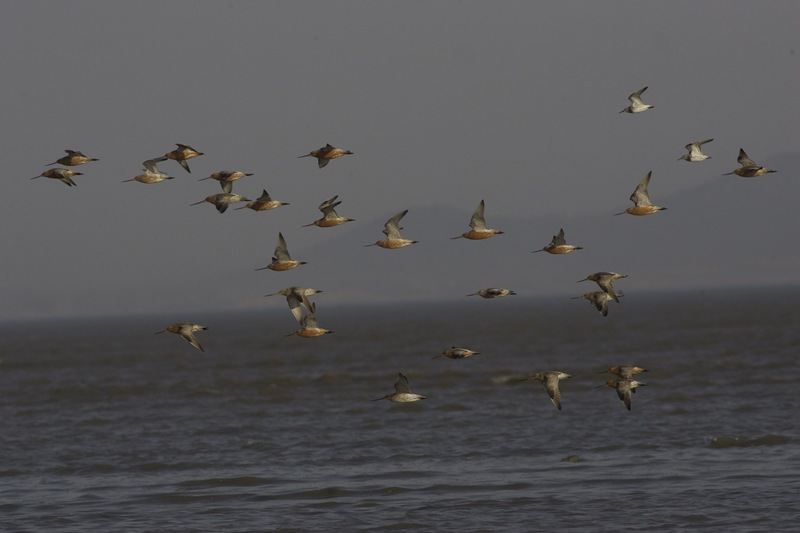 Chris Hassell from the Global Flyway Network just emailed me a copy of his 2011 report on migratory Red Knot using the rapidly shrinking mudflats in the Bohai Bay, a couple of hundred kilometres south-east of Beijing. It covers Nanpu, the area I visited and blogged about a few weeks ago. Overall, it is again depressing reading but there is a glimmer of hope in the form of WWF China’s work to raise awareness of the plight of these shorebirds and the proposal to try to protect at least a small portion of these important mudflats from the seemingly endless development and land reclamation that is currently taking place. I wish them luck and will be using every opportunity I have through my professional engagement with Chinese government officials to promote this issue. 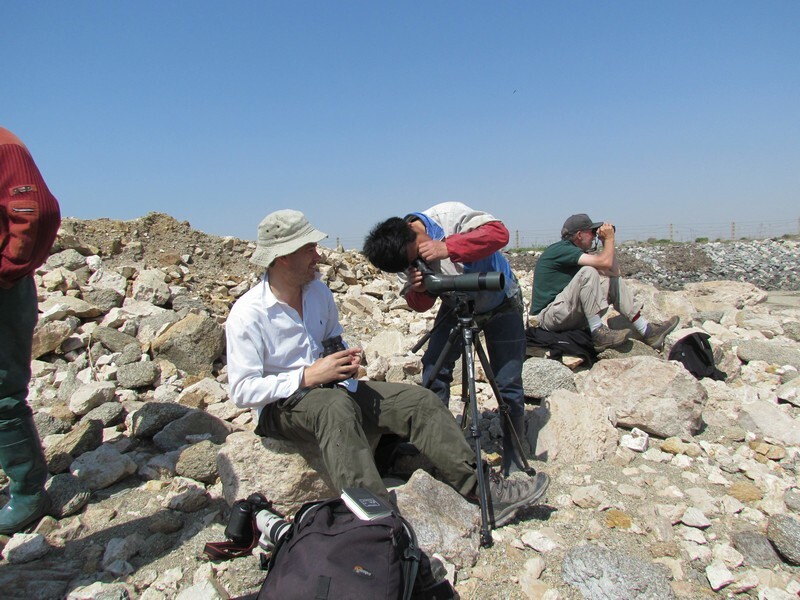 During my trip to Liaoning Province in May, primarily for visible migration at Laotieshan, I spent a day with Tom Beeke and Spike Millington north of Dalian towards the North Korean border, to look for waders. The whole area is brilliant with good numbers of mudflats holding birds such as Terek Sandpiper, Red-necked Stint, Lesser Sand Plover, Bar-tailed and Black-tailed Godwits, Sharp-tailed Sandpiper, Great Knot, etc etc. It was along this stretch of coast that we enjoyed fantastic views of hundreds of waders gradually walking towards us on the incoming tide, most of which were in stunning summer plumage and on their way to their arctic breeding grounds. It was awesome to see so many Great Knots, Terek Sandpipers, Greater Sand Plovers and the ‘sakhalina‘ subspecies of Dunlin – simply stunning birds. Among the flocks, we saw several colour-flagged birds and, having noted down the details and reported them to the Global Flyway Network, I received some fascinating data about the individual birds. One Bar-tailed Godwit, originally flagged in Australia, was at least 19 years old (!) and another was flagged near Auckland, New Zealand, over 10,000 kilometres away from where we saw it… amazing! It was this experience that prompted me to find out more about the East Asian Flyway, the studies taking place and the information these studies were revealing and it was through these inquiries that I made contact with Chris Hassall. For the last few years Chris has been visiting the Bohai Bay in Spring and, with local PhD student Yang Hong-Yan, he has been studying migrant waders using this area, with an emphasis on the Red Knot. Their work has contributed a huge amount to our knowledge of the movements of waders and how long they spend at these stopover locations, revealing the importance of the Chinese coast. 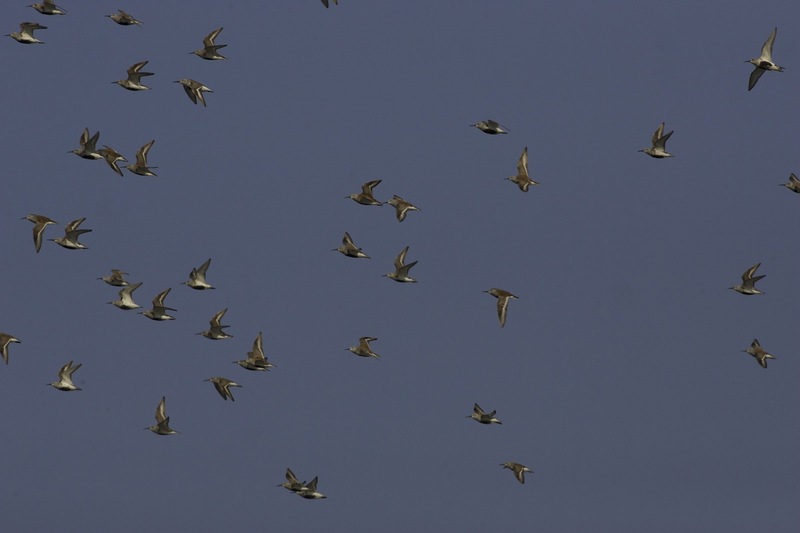 The numbers of birds passing through is incredible – Chris counted an astonishing 64,000 Red Knot in the Bohai Bay near Tangshan on one day in early May 2010! One of the key methods for obtaining information about the movements of these birds has been colour-flagging or banding. Colour-flagging schemes are now being operated in several countries along the flyway including Australia, New Zealand, Indonesia, China and north-eastern Russia. Birds caught are marked with either plain coloured flags, engraved leg flags (ELF) or 4 colour-bands and one flag. Each capture location has its own colour flag and/or position of the flag on its leg to allow easy identification of the origin of each bird. The birds with plain flags cannot be identified to individual level but simply reveal the place where that individual was banded. The colour-bands and the engraved leg flags can be attributed to individuals, allowing fascinating life-histories to be discovered. The flagged Terek Sandpiper we found at Pikou. 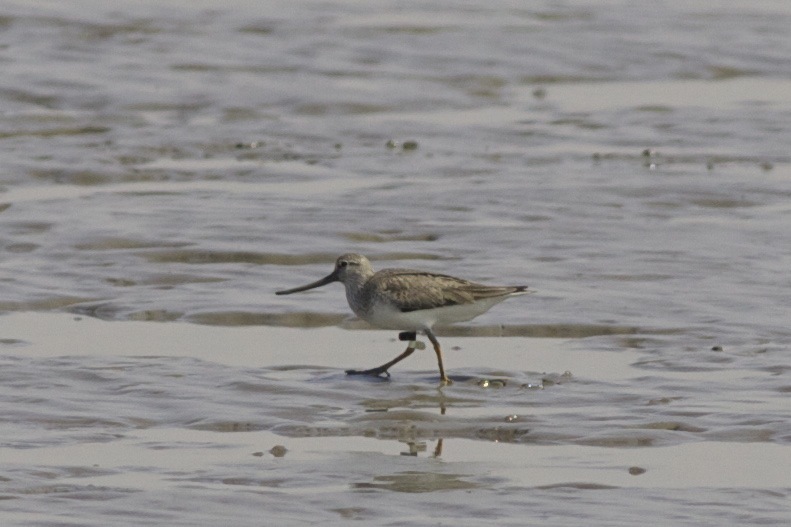 This individual was colour-flagged at Chongming Island (southern China). These schemes have allowed Hong-Yan, Chris and his team to identify Red Knot from as far afield as Chukotka, Kamchatka, Sumatra, Chongming Dongtan (China), 5 sites in Australia and both north and south islands of New Zealand. The study has also revealed the differing migratory patterns of the two subspecies of Red Knot – rogersi and piersmai – with rogersi (from SE Australia and New Zealand) arriving earlier and leaving their eastern Siberian breeding grounds earlier than the piersmai birds, predominantly from NW Australia and breeding on the New Siberian Islands. One of the major threats to these birds is land reclamation which is happening all along the Bohai Bay coastline at a frightening pace. The China Marine Environment Monitoring Centre estimates that between 2006 and 2010, 1000km2 of land were reclaimed EACH YEAR in China. Added to this, the Bohai Sea is the most polluted in the world; it absorbs nearly 5.7 billion tonnes of sewage each year and 43 of the 52 rivers that flow into it are heavily polluted. 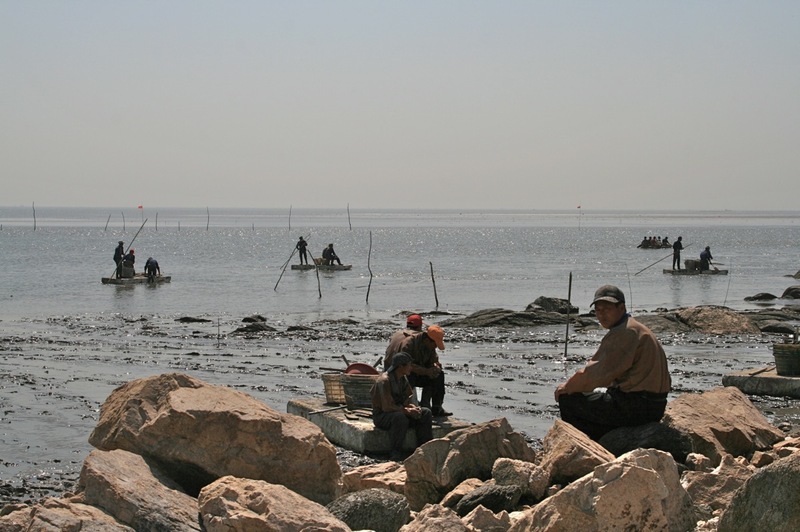 Traditional 'harvesting of the mudflats' for crabs and shellfish.. a way of life that is also threatened by the huge reclamation projects on the Chinese coast. It is perhaps surprising that the number of birds at Chris’s study site has increased in the last few years. However, this is almost certainly due to the destruction of nearby habitat where many birds used to feed with birds now ‘crowding’ into an ever-decreasing feeding area. A big concern now is the sustainability of the remaining areas. Competition for the declining food sources will almost certainly mean birds will have to move on earlier and with fewer fat reserves, which could lead to a higher mortality rate and lower breeding success. As Chris mentions in his latest report, all of the migratory birds using the Bohai Sea coast and covered in his report are covered by the China-Australia Migratory Bird Agreement and it should be a “source of embarrassment to both governments that this destruction of critical habitat.. ..is happening“. So what are the prospects for the future? Chris and his team are leading, with WWF-China, calls for part of the area – including mudflats and some of the saltpans – to be protected by establishing an ‘International Shorebird Shared Resources Reserve at Bohai”. The mudflats would provide the inter-tidal area for migrant and wintering shorebirds and the saltpans could be developed as high-quality high tide roosts and breeding areas for Avocets, Black-winged Stilts and Kentish Plovers. Let’s hope this proposal gains enough support to outweigh the local financial incentives for development. Below is the list of colour-flagged or banded birds we saw along the coast between Pikou and Zhuange on the east coast of Liaoning Province in mid-May. I find this data incredibly rewarding and it adds a new dimension to wader-watching. It has even converted wader-wary local birder, Tom Beeke, into a shorebird fan! (well, almost…). Yellow engraved “ELT” flag on right leg. This bird was flagged Beaches, Crab Ck Rd, Roebuck Bay, Broome, Australia, approximate co-ordinates 18deg 0min S, 122deg 22min E, which uses the flag combination ‘Yellow Engraved’, on 1/04/2011. Originally ringed on 2 April 1994 as a 2+ years old bird. This bird is now 19+ years old! This bird was flagged Beaches, Crab Ck Rd, Roebuck Bay, Broome, Australia, approximate co-ordinates 18deg 0min S, 122deg 22min E, which uses the flag combination‘Yellow Engraved’, on 5/03/2005. of 343 degrees, from the marking location. combination Yellow, sometime since August 1992.
of 1 degrees, from the marking location. flag combination White, sometime since 22 December 1991.
of 323 degrees, from the marking location. combination Black/White, since April 2006. 5 degrees, from the marking location. combination Black+White (inferred), since April 2003. 4 degrees, from the marking location.